Inside LabourStart » What kind of employer locks out their workers 3 days before Thanksgiving? What kind of employer locks out their workers 3 days before Thanksgiving? 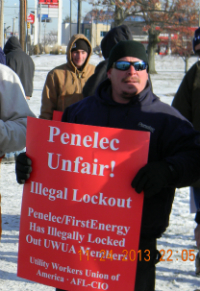 FirstEnergy sounds like a very nasty employer, having locked out 150 unionized workers three days before Thanksgiving. They’re the target of the latest LabourStart campaign, launched at the request of IndustriALL and PSI this afternoon.